This is Rokinon’s newest fisheye lens for Canon. 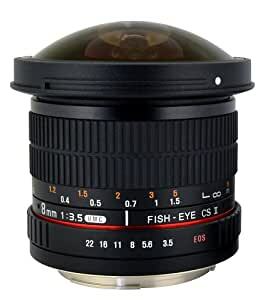 It features some great new features that are not available on Rokinon’s first highly rated 8mm f/3.5 fisheye lens. Optics and glass are high definition (HD) with very clear & sharp images. This lens also features a removable hood which can make it easier for use on full frame cameras. While this lens is designed for APS-C sensors, full frame users can now use it without the hood. On APS-C cameras like the Canon 60D, 7D and T3i, the pictures will fill the entire frame or screen. On full frame cameras like the Canon 5D, the lens will produce pictures with a semi-circular image and close images will appear proportionately large for a dramatic effect.